Email is an undisputed champ for generating a high ROI. But it’s not a black box—it’s rich with detailed email metrics that are critical for understanding and managing performance. 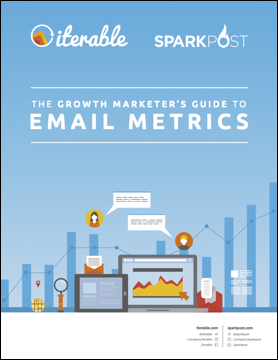 In this guide, SparkPost has partnered with the growth marketing experts at Iterable to help you understand what metrics matter when you’re implementing high-performing email campaigns. The pivotal metrics used by email marketers, developers and technical operations, and executives. Industry-standard benchmarks for engagement, deliverability, and performance. How Iterable and SparkPost’s joint solution makes growth marketing with email a winner. This guide is a great resource for growth marketers and technologists looking to understand the metrics that drive high-performing email campaigns. Download “The Growth Marketer’s Guide to Email Metrics” today.